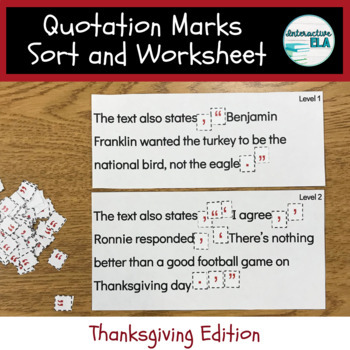 With this Quotation Marks Sort, students are provided a more hands-on learning experience as they get the opportunity to manipulate the punctuation marks and insert them into the text evidence and dialogue in the appropriate places. We provide 2 levels for differentiation. 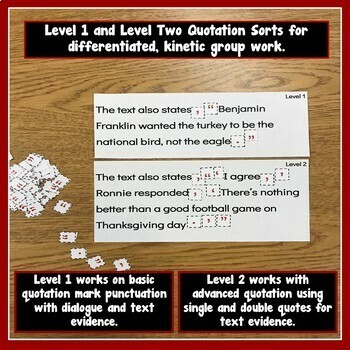 Both levels have proven to be effective for our students for either 1) reviewing where to place quotation marks, commas, and periods, or 2) introducing the concept of how to use double and single quotation marks. Included in this product are leveled worksheets that mirror the sorts for initial informal pre-assessment to give the teacher quick information! An answer key is also provided for the teacher to allow the students to do a quick check themselves or with their accountability partners. There are so many ways to utilize this product for effective practice! This product is included in our Interactive Quotation Practice product which is designed for Google Classroom users. We've created a variety of sorts to support learning in Language Arts. Check out our Language Arts Word Sorts Growing Bundle. We don't sell products that we don't use and love for our own students. We specialize in sorts and Google Classroom activities for Language Arts intermediate grade levels. Follow our store for updates! We know teachers are busy, but please be sure to rate our products so you can get some TpT credit for your next purchase! Your opinion is valued and appreciated! Permission is granted to copy pages specifically for student or teacher use only by the original purchaser or licensee. The reproduction of this product for any other use is strictly prohibited. Copying any part of the product and placing it on the Internet (even a personal/classroom website) is strictly prohibited. Doing so makes it possible for an Internet search to make the document available on the Internet, free of charge, and is a violation of the Digital Millennium Copyright Act (DMCA).